Estate of John Garner Dec'd. by Administrator James Garner. Noted held on/by the following: Judith Garner, Thomas W. Ritter, E.N. Moffit, J.D. Graves and James Garner. Judie/Judith Garner [age 64], Browers Mills Post Office, Moore County, NC resident and widow of John Garner, applied for a widow's pension in Moore County, NC. Garner stated that her deceased husband served under Captain N. Tucker and enlisted in Carthage, Moore County, NC in Aug 1814 and discharged Mar 1815. At the time of enlistment, he was described as 26 years old, 5'10" tall, light hair, fair complexion, and blue eyes. John Garner and Judie Ritter were married Jun 1839 by W.M. Johnson, JP in Moore County, NC. John Garner was previously married to Dolly Whittle/Whettle who died in Feb 1839. John Garner died May 12, 1867 in Moore County, NC. Elias Maness testified to having been at the wedding of John Garner and Judith Ritter in Jun or Jul 1839 by W.M. Johnson and to having made John Garner's coffin when he died May 12, 1867. James Garner also attested to John Garner and Judith Ritter's marriage in 1839 and Garner's death in 1867. 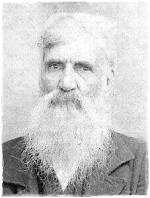 Elias Maness [age 60] and James Garner's [age 60] testified that John Garner's first wife Dolly Garner died in 1839, the same year as James Garner's son was born and they both had known Judie Garner for 50 years. Elias Maness and W.B. Garner testified that John Garner was born Mar 3, 1788 the same year that John Maness was born. A notation in the file states that Judith Garner died Oct 26, 1900. Eli N. Moffit also testified that Judith Garner was the widow of John Garner.